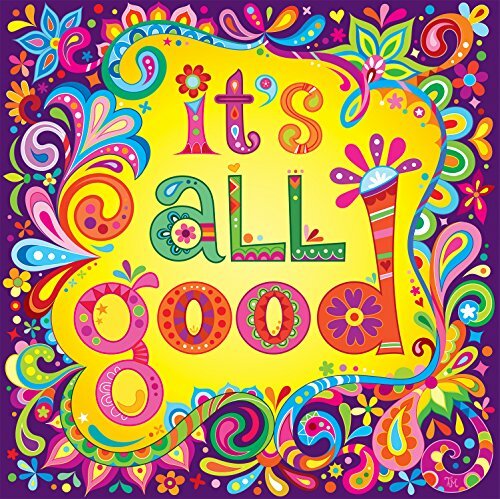 This 550 piece jigsaw puzzle from Cacao features 'It's All Good' image. Finished size is 20" x 20" and is proudly made in the USA. Founded in 1987, Cacao puzzles has remained true to their mission: to create high quality, innovative and challenging jigsaw puzzles and to provide hours of family fun. Cacao puzzles pride themselves on developing and maintaining long standing relationships with some of the finest artists of their time. Cacao talented team of puzzle designers and marketing professionals are continuously searching the world over for developing trends, emerging artists, and new technologies involving printing, die cutting and unique puzzle materials. Cacao purpose in puzzles is clear: to continue to bring you the very best in family entertainment. Count on Cacao puzzles for the most creative, exciting and colorful puzzles products ever!.